A German Shepherd’s sense of smell’s has such a degree of precision that it can smell an individual particle in a group of over three hundred million different particles. The types of dogs used in K-9 units have scents that are tens of thousands of times stronger than humans; we can smell a cake baking, but the dog can smell whether or not the cake had sugar or a sugar substitute. Training a dog to be capable of using its sense of smell to detect explosives and narcotics is the everyday duty of a K-9 officer, a member of a police force who works with their animal in order to prevent crimes. What does it take to be a K-9 officer? A K-9 officer must partake in much more rigorous activities than giving speeding tickets. Since each dog represents a major investment of time and resources, they are only used for some of the most high-profile cases that a justice department has. For example, a murder case will require the services of the dog in order to smell out a cadaver, a blood trail, or to match the scent on a weapon with the perpetrator itself. Whenever a department issues a search and rescue after a disaster, the canine team has to wade through flooded streets or rubble or mudslides to find both survivors and those who perished. Many times the dogs serve in high-traffic areas like airports to sniff out terrorists who smuggle explosives or drug mules who carry narcotics. You do not need to previously have worked with dogs, or even ever had a dog as a pet, in order to be a K-9 officer. The US Police Canine Association offers certification for officer training as well as master training for all police officers. 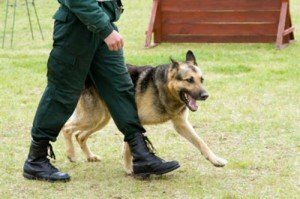 This certification gives you the ability to work as a police dog trainer and officer anywhere in the country. Canine officers succeed when they complete two- or four-year degrees in criminal justice to better understand cases and crime. If you have a dog, you likely know how to housetrain it, teach it how to speak, or teach it to shake hands. K-9 training features much more rigorous activity for a dog, including attack commands as the dog learns how to go for a target’s exposed areas whenever they present a threat to an officer or to civilians. Each dog learns tactical applications like how to track scents and how to smell for the difference between multiple types of explosive materials. Dogs also learn how to train alongside one another when it is necessary to conduct searches or work crowds in tandem with other dogs. The national K-9 Trainer Center offers more information about training for dogs and their handlers.